Future-Ready Testers for Countless Applications in Transportation, Energy, Medical Devices, Defense, Scientific R&D, Telecom, and more. 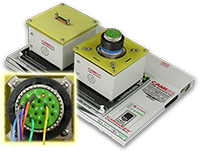 Expandable and upgradable diagnostic and Pass/Fail Cable & Harness Test Systems for assembly, prototyping, production, and QC of standard or custom single or multiconductor cables. 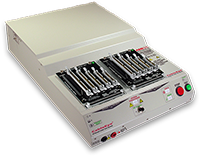 Instantly measure, display, and document basic electrical properties such as continuity, resistance, dielectric breakdown, insulation resistance, miswires, twist pair relationships, and intermittent faults. Reliably improve productivity, product quality, and documentation with rapid ROI, and reduce RMA and Warranty Costs. For diagnostic and Pass/Fail Testing - Find, display, log, document: continuity (opens, shorts, miswires, intermittent connections), contact and isolation resistance, embedded resistors and diodes (orientation, forward voltage, reverse breakdown), precision resistance (4-wire), and capacitance (twist wire relationship, length of cable, length to break, capacitors). For diagnostic and Pass/Fail Testing - Permits expanded testing for insulation resistance and dielectric breakdown after checking for opens, shorts, miswires, and resistance limits. Precision resistance (4-wire), and capacitance measurement (twist wire relationship, length of cable, length to break, capacitors) are available. For assembling connectors used in aerospace, automotive, medical, and other high-reliability applications. 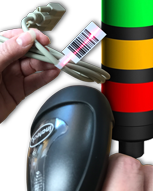 Auto-detected, plug-in fixtures for fast, convenient set-up and testing of standard cables. Choose from an extensive library of stock boards. 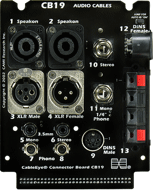 Most are populated with 'families' of connectors such as the audio market CB19. We invite you to use this form to suggest a configuration you would like to see us include in our library. 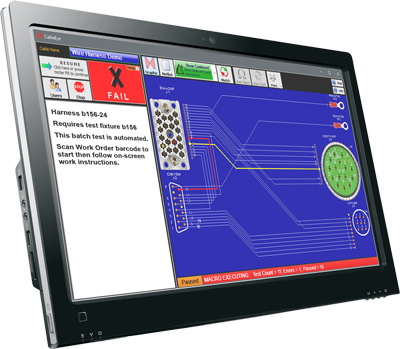 The entire suite of products is powered by the same easy-to-use software and, with the help of its signature easy-to-interpret color-coded graphics, instantly identifies not only when there is a fault, but what type of fault and where. All testers ship with this comprehensive software that provides test functions, connectors database, graphic wiring display, reporting, data logging, automation scripting and many more features. Robust - Versatile - Easy to Upgrade.